Despite its 700 pages of typescript and the fact that it was delivered at yet another major turning point in Lacan’s teaching career, From an Other to the other remains unpublished and is rarely referred to in the Lacanian literature. Coming between the intriguing Psychoanalytic Act and the landmark presentation of the four discourses, it was the last of the seminars to be delivered at the Ecole Normale Superieur, and also the last to be held on a weekly basis. In terms of the sheer physical effort involved, the twenty-five sessions may well have been designed to demonstrate to the young Maoists – including his son-in-law – circling round him, as well as to his traditional opponents, that the old man was not finished yet. Lacan seems to feel that he has to engage with an array of contemporary discourses that relate to his own central concern regarding the structure of the subject. But he opens up so many different fronts that it is often hard to know where the key battles are being fought or where the important advances are being made. 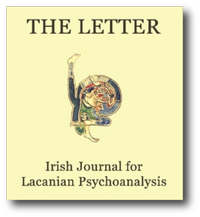 This paper attempts to demonstrate the importance of the work of Levinas for an ethics of psychoanalysis that transcends ideological difference. Firstly, the role of language in psychoanalysis and the construction of subjectivity is stressed, secondly, the work of Bion and the containment of anxiety. However, beyond these ‘positions’, there remains the impossible proximity of the other as singularity, for whom, according to Levinas, I am responsible without limit. For Levinas, as for Freud, the subject is not one, but instead, open, gaping, exposed between being and nothingness, a diachrony, which language, the Law and philosophical systems in general, dissimulate and betray. Technique saves the analyst from this proximity of the ‘client’ but at once becomes cynical and complacent, unless it remains haunted by its own resistance to the other, indeed its own failure. Analysis is a discourse that has consequences. For the suffering subject the renunciation of enjoyment is elaborated in a discourse of the body. In the course of analysis this is a topologically arranged discourse involving loss. The body of enjoyment is not equivalent to the body as intuitively recognised at the level of the ego or the specular image. I will illustrate this absence of equivalence clinically. I will also attempt to demonstrate how the body of enjoyment is topologically arranged. Our Annual Congress this year has an even more difficult title than usual. I can’t afford to think too much about how you will receive what I have to say about the clinic of the body of enjoyment. My knowledge is obviously derived from clinical work and is supported by the current seminar. I have a certain discomfort with the difficulty of the topic and the different levels of understanding among people in the audience. I have no choice however but to put this anxiety aside, bearing in mind that this is, after all, our annual congress, the seventh since 1994 – which is no mean record – and the place where one can present work in progress. ‘From ‘Mehnvert’ to ‘plus-value’ and back …’: this rather enigmatic title of Gerry Sullivan’s contribution suggests a relation between the Mehnvert or surplus value of Marx and the plus-de-jouir or surplus puissance of Lacan. On the one hand we know that Lacan’s plus-de-jouir is, among other things, a conceptualisation of Freud’s idea of the Lustgewinn – this Lustgezvinn being the pleasure liberated by a joke when, for a moment, we may drop our lifelong sustained effort at repression. We could say this is a free pleasure, a pleasure that costs nothing. On the other hand, there’s this intriguing remark on the Mehnvert by Lacan, in his sixteenth Seminar D’un Autre a Vautre, precisely in the year 1968. There Lacan recalls how Marx, at one of the ‘fertile moments’ of his discovery of the Mehnvert, had been struck by the laughter of the capitalist. Indeed, according to Marx’s dialectical experience the capitalist master cannot help laughing when, trying to justify what he’s doing, he succeeds in hiding that he’s putting into his own private pocket the Mehnvert produced by the slaves of the working class. This laughter provoked by the hidden possession of this Mehnvert also seems to correspond to a pleasure that costs nothing. And maybe in its own way, and on its own level, this free pleasure of the capitalist Mehnvert is also the result of a kind of joke, in this case a huge economic joke. Of course, I am not saying that the economy is a joke. I only say that it is structured like a joke, that it has the economy of a joke if I may say so. However this may be, for Lacan this quasi-maniacal laughter of the master is the sign of his avoidance of the object little (a) – or the avoidance of a pleasure that costs too much, what Lacan calls puissance. The work of the analyst is sometimes described as to allow the analysand to unpack his suitcases which up to then he dragged with him full of unnecessary ballast, so that a new journey can begin with less baggage. The way in which an analyst attempts to make this possible is by presenting the analysand with a bag with a hole in it. The analysand, in unpacking his suitcases, is eager to try to fill the bag of the analyst, in order to leave him to decide which items to bring and which not. The analyst’s task is to keep the bag open all the time. However, because of the hole, everything that goes in the bag, inevitably ends up on the floor. In the end, depressed by his vain attempts to involve the analyst in choosing and provided with a better overview of the contents of his luggage, the analysand decides to fill his own suitcases again, leaving the rubbish to keep company with the holed bag of the analyst. Introduction In terms of the meta-psychology of psychoanalysis, Freud’s Project for a Scientific Psychology may be seen as one of his seminal works. In this Freud sets out a particular view of the mind to which he returns many times, most notably in chapter seven of The Interpretation of Dreams. The fact that he develops this model of the mind from an ‘economic, or one might even say a ‘physiological’ beginning to a final psychological form does not change its fundamental structure. Freud abandoned the Project shortly after he sent the initial draft to his friend Fleiss in October 1895. Nevertheless, he continued to hold the view that the psychic apparatus, which from this point onwards he explored from a mentalistic or psychological perspective, would in some future time be explained in terms of physiology. In this regard, Ernest Jones says of the Project that it represents Freud’s ‘last desperate effort to cling to the safety of cerebral anatomy’. Having been dispatched by Cormac Gallagher to a conference on Neuroscientific and Psychoanalytic Perspectives on Emotion this summer, I concluded that to bring together neuroscience and psychoanalysis is a challenge to say the least and that Cormac, by sponsoring this trip had set me – should I choose to accept it – a ‘Mission Impossible’. For many psychoanalysts, neuroscience is imbued with all the imaginary enmity associated with the other; for neuroscientists, psychoanalysis is generally treated with disdain, provoked by the lack of certainty that is crucial to psychoanalysis. Dialogue between the two fields is, when it does occur, hostile in the main. The relationship between psychoanalysis and neuroscience is like that of the subject and his counterpart; each sees in the other unforgivable faults and failures. I hope to move the context of this debate from the ‘other’ to the ‘Other’ and to shift the potential dialogue from the imaginary to something more fruitful. … The text given here of Claude Landeman’s contribution to APPYs annual congress retains the conversational tone in which it was delivered. Claude Landeman spoke on the day via Cormac Gallagher’s (almost!) simultaneous translation and we owe this present text to his efforts on that occasion and to those of the diligent note-takers in the audience. This work is an edited version of the compilation of their combined efforts. To give you a definition of a ‘wake-up call’, Pascal’s wager is just such a wake-up call. Se reveiller, river, – the function of waking up goes against our most beloved function, our dearest wish, which is to dream, to sleep. You all know that Freud said that the ultimate desire of the dream is the desire to go on sleeping. This goes some way to explain why in relation to Pascal’s wager there has only been misunderstanding, only failure to understand and disinterest from everyone who studied him, starting from the publication of the Pensees, in which the wager is prefaced by a little note to the reader explaining that this wager was only addressed to Libertines, or unbelievers. Things have gone on just like that – Pascal the French genius who reduces the wager to a matter of self-suggestion.